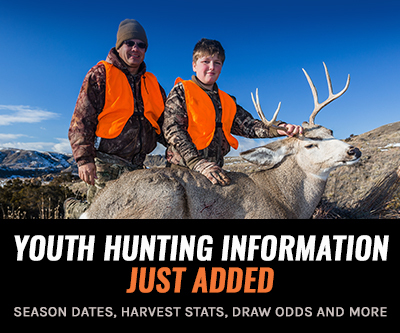 We understand that Western hunting is extremely expensive; with application fees, hunting licenses, etc and technical gear only adds on top of that. Our rewards program is hands down the most generous out there. We want our INSIDERs to get the best equipment in their hands for the best deal possible. In this industry, minimum advertised pricing (MAP) is a very enforced rule. This is why you often see the same price for a product at various retailers. The challenge we had was we wanted to give INSIDERs the best deal possible but we still needed to play within the MAP rules enforced by the manufacturers. We decided to build our own rewards program that will issue INSIDER points on all purchases (basically store credit) back to our store that they can use on anything they want. How do INSIDER points work? Each product will show how many points you'll earn upon purchase. Each item in the store will have the ability for goHUNT INSIDER members to earn points (INSIDER points/store credit) that you can then redeem on anything in the store. The amount of points is based off of our margin, so it's varible by product. On our higher margin items, we give more points. Non-members cannot earn or redeem points. 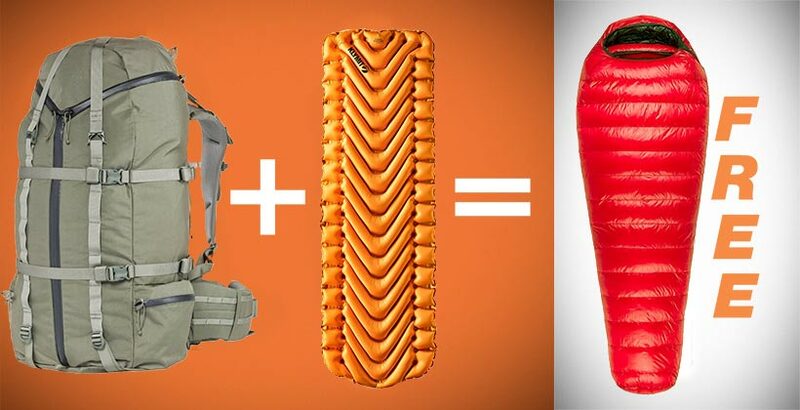 For example: let's say you want to build a lighter camp system from the ground up, if you buy a backpack and sleeping bag, you’re going to get a sleeping pad for free. 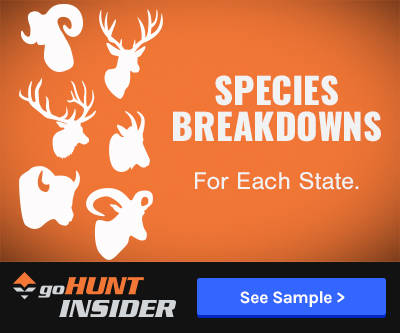 Our store is the next value add to our INSIDERs and we want goHUNT to continue to be the one source that they use all the way through from planning and preparing a hunt and now buying the gear they need for their hunt. When checking out, enter in your customer information. On the right it will show how many points you'll earn for the order if you're an INSIDER member. After you've submitted the order, when you go back to the homepage you can see how many points you have in the header. You can now use your points on any item in the store. 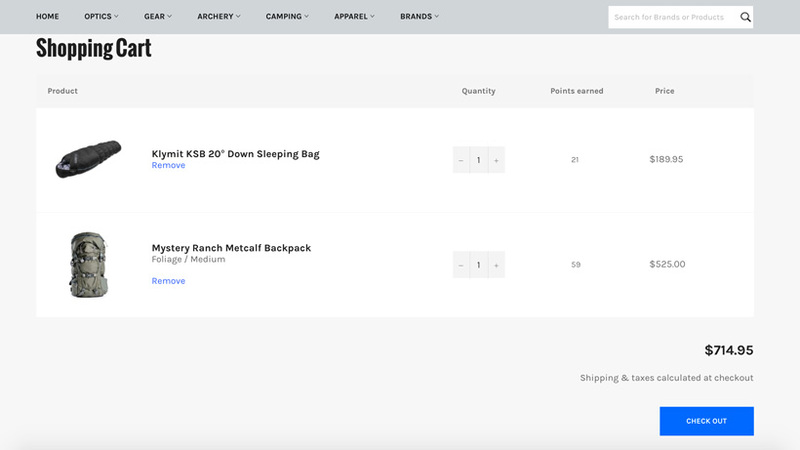 Just add an item to your cart, and when checking out, select how you want to use your points (all or none). 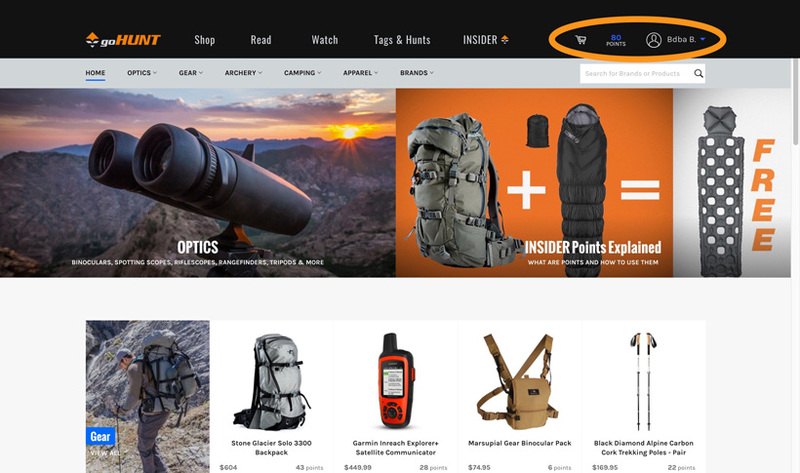 In this example we added a Klymit Inertia O Zone Sleeping Pad to the cart that costs $79.95 and by using 80 points, you would get this item for free. Once you apply the required points, you'll see that you're getting the item for free. In our rewards program, one point equals one dollar. There’s no fancy tricks about having to earn 500 to 10,000 points in order to redeem $1 back or anything like that. Ours is a true rewards program. Points are earned on variable margins. So the higher our margin, the more points we give you back. Hey @ Brett B! We are always happy to let renewing members opt into whatever promo we have going on. 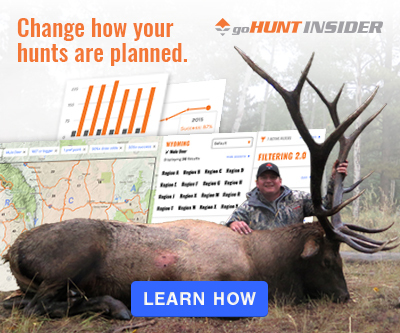 Once your renewal goes through, send me a quick email at nick@gohunt.com and I will make sure you get your store credit. Let me know if there is anything else we can help with! Do we get more points when our yearly membership renews? Did you by chance enter a promo code when you signed up? If not, no worries we can help you out. If you did use one when you signed up those will be added to your account, it typically takes about a day. We have a guy that adds those manually each morning. If you don't see them reach out to me at trail@gohunt.com or 702 847 8747 ext 3 or 4. Welcome aboard and thanks for being an INSIDER! Just a quick question, I was explained that when we sign up for gonhunt we get 50 points added to our profile. Is this true? Hi Jeremy, you didn't earn points on your tripod purchase because you bought the tripod when it was on sale. No points are earn on sale items. I hope this helps. Thank you for being an INSIDER! Hi there. My profile shows I have 0 points in the online shop when I bought a tripod? Awesome stuff guys, cant wait to scroll through all the gear. Will you be offering international shipping ie. Australia? The curation of our gear offering took a lot of time and we only plan on making it better. We definitely know how overwhelming the options are out there and how annoying faulty gear is... Thanks! Sounds pretty straightforward to me...intuitive. I'm excited about this. The points are a bonus, but being able to see the gear that you guys have put so much research into...and use. I haven't even heard of some of this stuff. Thanks!